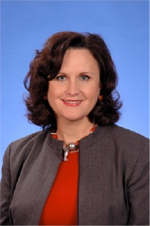 Denise M. Butler has been chosen to be one of the 2010 honorary membership awardees. Denise was born in Florence, Alabama, and grew up in Tennessee and Kentucky. She graduated with a B.S. degree in biology from Tulane University in 1975, lately receiving her M.S. in geology from the same institution. Her career in the oil business began with Chevron's micropaleontology group in New Orleans, LA. There, she was trained in foram analysis of the late Tertiary and Pleistocene and worked for the offshore exploration and production groups in the Gulf of Mexico. Denise left Chevron in 1984 to join Sohio (later to become BP Exploration). She spent five years as a Senior Geologist in offshore operations, specializing in foraminiferal biostratigraphy and computer applications. She also designed and served as database administrator for the Sohio/BP's paleontological database. While at BP, Denise also served as Technical Service liaison to Exploration and was a member of the Stratigraphic Studies Group. In 1993, Denise left BP and joined Pennzoil as Biostratigraphy Coordinator and designed and managed their computer database for storage and retrieval of paleontologic data. She later became the Geologic Manager of the Technology Division for PennzEnergy. Denise joined Shell Exploration & Production Company in Houston, TX, in 2001 and is currently the Upstream Americas Geoscience Discipline Chief, providing functional leadership and guidance for all exploration geologists and geophysicists in North America, Gulf of Mexico, and South America. Denise first joined GCSSEPM in 1980. She has served as Vice President (1986-87); 1987 program co-chairman and co-editor of the 8th Annual Research Conference; Section President (1990-91), and Foundation Trustee (1993-98); and in 1996, she received the Distinguished Service Award. Denise has served on several conference organizing committees of numerous GCSSEPM Foundation research conferences. She is currently serving on the Advisory Council for Jackson School of Geosciences, University of Texas; Advisory Committee for the GeoFORCE Houston Project; and the AAPG Education Committee. She is also a member of the SEPM (our national organization), the Women's Energy Network, AAPG, HGS, SEPM, and GCSSEPM. Denise has maintained her support for the Section and Foundation by insuring that Shell geologists attend our conference (important for training) and providing financial support for our conference and fellowships. Her continued support after official retirement shows her commitment and we are pleased to recognize her efforts with honorary membership.